Silverline Chemicals is among the most reputed Aromatic Chemicals Manufacturers & Exporters in Haryana. 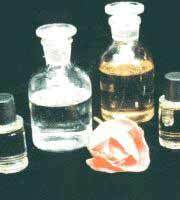 We offer a huge assortment of Aromatic Chemicals including Phenyl Ethyl Propionate, L- Menthone (all grades), Linalyl acetate, Rose Oxide and many more. Manufacturing of all our Aromatic Chemicals is carried out in strict adherence with the highest standards of quality and safety. We emphasize on proper packaging to make sure that the Aromatic Chemicals reach the buyer in perfectly safe and sound condition. Our huge production capacity enables us to handle bulk orders very efficiently. Impeccable quality, timely delivery, reasonable pricing and complete customer satisfaction are the factors that separate us from other Aromatic Chemicals Manufacturers & Exporters in India.